Grate-Fast standard bar grating clips consist of a top saddle and lower body casting, connected by a 3/8” socket head galvanized cap screw bolt. They are one of the most secure types of bar grating fasteners we offer, and they have the additional benefit of being simple to use and easy to install. Other options include the Grate-Fast 3D and 4D, which feature a longer screw bolt for use with deeper bearing bars, and the Grate-Fast FG series, which are made from 300-series stainless steel and available with either offset or flat-wing saddles. For assistance choosing the best Grate-Fast bar grating fastener for your application, use the form on this page to get in touch with a Marco Specialty Steel representative directly. From start to finish, the installation process takes only a few seconds. Grate-Fast clips can be easily removed and reinstalled using the same procedure. 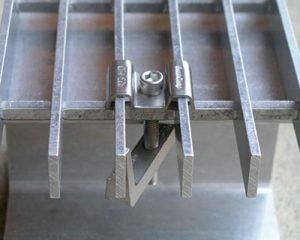 Grate-Fast clamps have a number of advantages over similar bar grating fasteners. They offer exceptional security while remaining fast and easy to install, without requiring welding, drilling or the use of any special tools other than a standard hex key. Standard Grate-Fast clips are designed to handle an ultimate load of up to 800 lbs., and an average side load of 450 lbs., depending on their depth and coating. 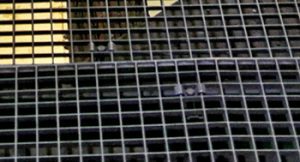 Grate-Fast fasteners can be added to any Marco steel or fiberglass grating product. We offer fast turnaround times on custom fabrications and dedicated service for clients in a range of industries. To request a quote or learn more about our products, get in touch today.